Retired Marine Sgt. 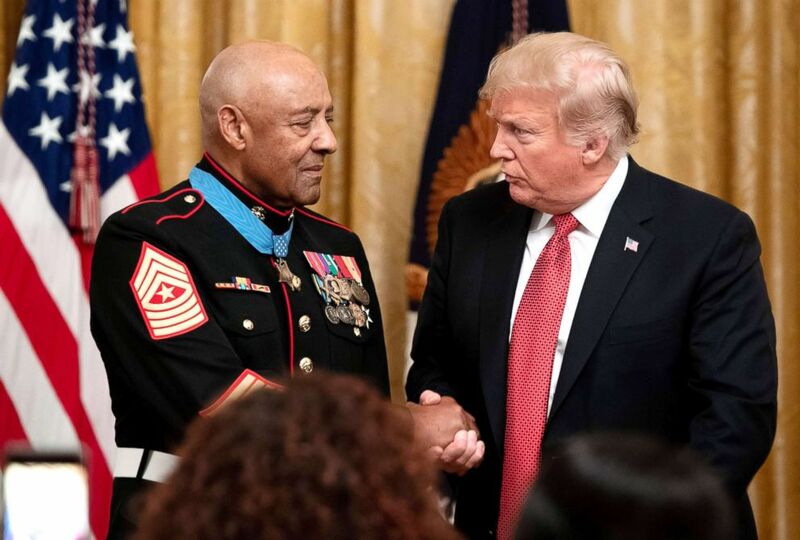 Maj. John L. Canley was awarded the Medal of Honor at the White House on Wednesday, 50 years after the heroism he displayed during the bloody "Battle of Hue" in the Vietnam War. 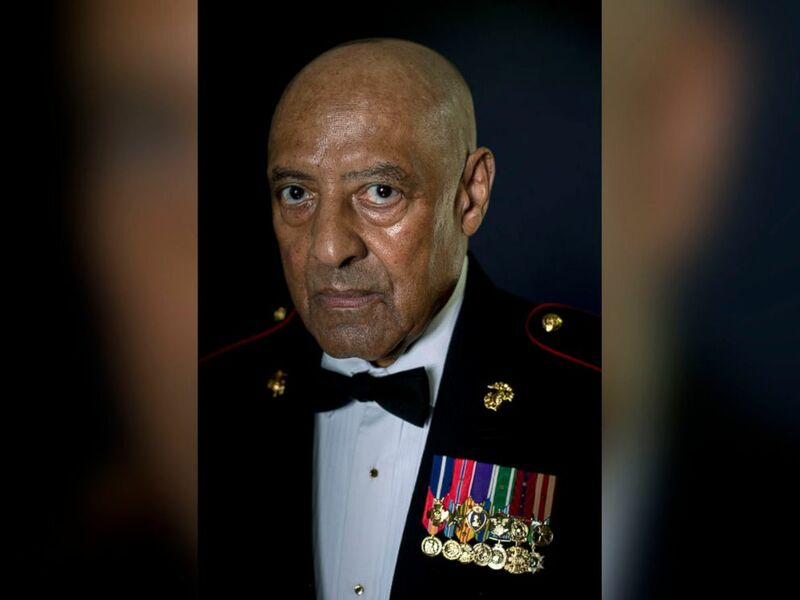 A portrait of retired Sgt Maj. John L. Canley, July 9, 2018. Normally, a recipient must be presented the medal within five years of his gallantry. But as time passed, and even though Canley had received other high honors, his fellow Marines, remembering how he risked his life repeatedly to rescue his wounded comrades, thought he deserved more, and campaigned for his case to be reviewed. Now, because of that effort, Canley has made history: becoming the 300th Marine to receive the nation's highest award for valor. 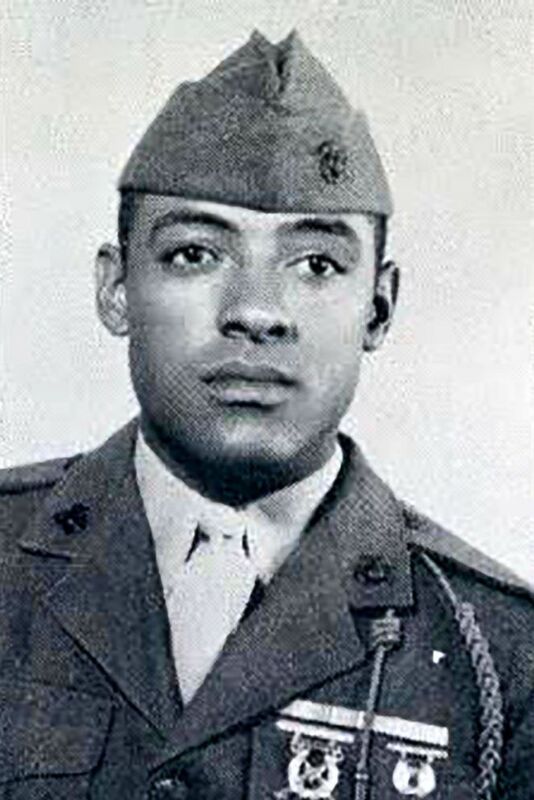 Sergeant Major John Canley, a Marine, served in the Vietnam War. In presenting the Medal of Honor to Canley President Trump called Canley "truly larger than life." President Donald Trump shakes hands with Retired U.S. Marine Sergeant Major John L. Canley, after awarding him the Medal of Honor for actions during the Vietnam War, at a ceremony in the East Room of the White House, Oct. 17, 2018. On January 31, 1968, the Viet Cong and North Vietnamese Army launched the Tet Offensive, a series of surprise attacks to seize cities and towns throughout South Vietnam, including Hue. What followed in Hue was an almost month-long battle by U.S. and South Vietnamese forces to retake the city in fierce urban combat. On the first day of the battle, then-Gunnery Sgt. Canley assumed command of Company A, First Battalion, First Marines after the captain in command was severely wounded in the early fighting. Canley led his company's men through intense fighting over the course of the next week fending off multiple enemy attacks and leading attacks on enemy targets. At the time, Canley's company was moving along a highway toward Hue City to help relieve friendly forces surrounded in the surprise attack on the city. Over the course of the next week, the company of 150 men would see heavy combat and take a high number of casualties. "In the days that followed John led his company through the fog and rain, and in house-to-house, very vicious, very hard combat," said President Trump. "He assaulted enemy strongholds, killed enemy fighters, and with deadly accuracy did everything you had to do," said Trump. "He raced into heavy machine gun fire on many occasions, all to save his fellow Marines." "In one harrowing engagement after another John risked his own life to save the lives of those under his command," said Trump. On Feb. 4, Canley led his company in taking over an enemy occupied school building, personally dropping a large explosive charge that led to heavy Viet Cong casualties and led the remainder to flee the building. Two days later, he led a successful attack to retake a hospital compound from Viet Cong fighters. During that effort he exposed himself to direct enemy fire as he twice scaled a wall to aid wounded Marines and carry them to safety. Fifty years later, a humble Canley downplays the heroism and leadership he displayed during that week of fierce fighting. "It's about taking care of subordinates," Canley said in a Marine Corps video interview. "As a leader, as long as subordinate unit leaders take care of their people, you don't really have to worry about the mission." "I think if a Marine comes to you with a problem, you must do whatever within your power to alleviate that problem," he added. 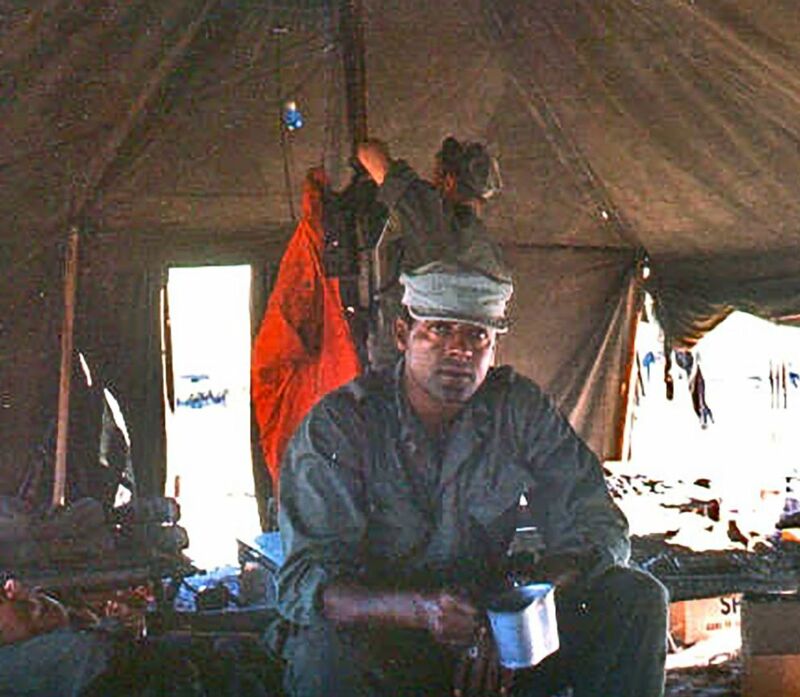 For his heroism in Hue, in 1970, Canley was awarded the Navy Cross, two Bronze Stars and the Purple Heart. The Navy Cross is the second highest award for valor that a Marine or Sailor can receive. But his fellow Marines in Alpha Company led an effort to have his actions reviewed to see if they merited the Medal of Honor. After a review lasting nearly four years, Defense Secretary James Mattis agreed that Canley's heroism merited the Medal of Honor. Rep. Julia Brownley, who represents Canley's congressional district in Oxnard, California, sponsored legislation that would waive the five-year time limit on presenting the award. Canley retired from the Marine Corps in 1981 after serving 28 years as a Marine. Trump said he had enlisted at the age of 15, using his older brother's paperwork to join the Marine Corps. Today, Canley is in remarkable physical condition considering he's 80 years old, leading President Trump to remark he looked fit enough to serve in the Marine Corps. "Nobody would know the difference" he joked. Retired U.S. Marine Corps, retired, Sgt. 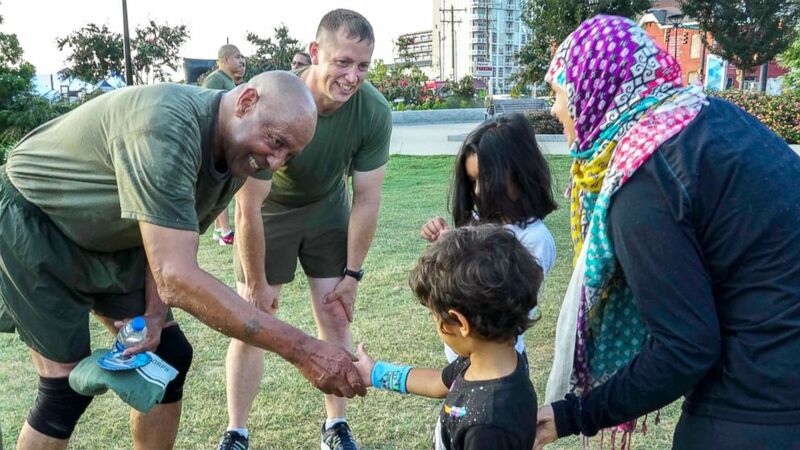 Maj. John Canley, left, and a local citizen pose for a photo after a physical training session during Marine Week in Charlotte, N.C., Sept. 7 2018. A recent video provided by the Marine Corps shows him holding his own while working out with young Marines nearly a quarter of his age. "I think physical training is something you should put on the top of your list, whether you're a Marine or a civilian," said Canley. " All I can say is keep it up, I think it'll pay dividends."